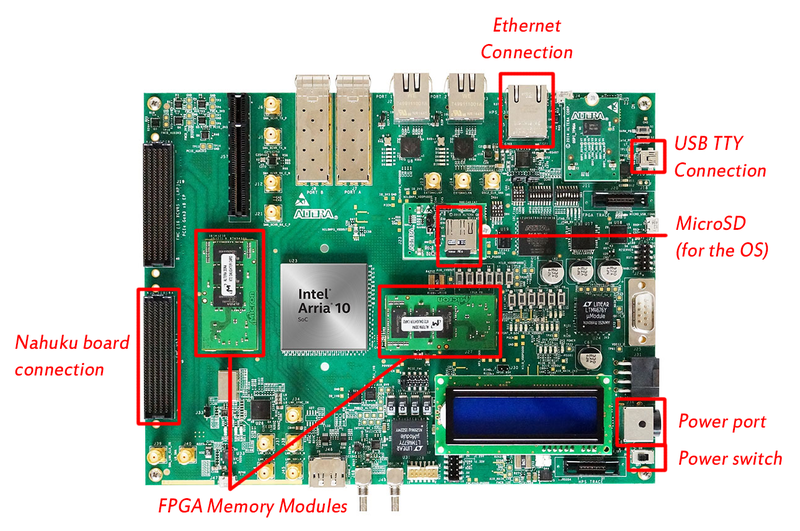 Currently, both boards use an Altera ARRIA 10 SoC FPGA board as the host. The Wolf Mountain board is paired with an ARRIA 10 based on the “Meridian Hill” (MH) architecture. The Nahuku board is paired with an ARRIA 10 based on the “Golden Hardware Reference Design” (GHRD) architecture. The remainder of this page explains how to set up a host-board pair. We will use the terminology introduced in the Overview (board, host, superhost). The Wolf Mountain board comes pre-connected to its host SoC. They are both contained within a single plastic box. The images below show the enclosure as well as where ports can be found. Configure the power supply units. Two bench power supplies are needed to supply 5.3V and 12V respectively. The bench power supplies should be dialed to the right voltages before they are connected to the Loihi system. The bench power supplies should also be off before they are wired to the Loihi system. Connect the bench power supplies to the appropriate “5V” and “12V” ports on the box. Take care identifying the correct ports before connecting the bench power supplies. Do not plug the 12V power supply to the 5V port or vice versa! Connect the USB tty cable (USB-A male to USB-A male cable) to the “TTY” port on the Loihi box, and connect the other end of the cable to the superhost. Connect the Ethernet cable to the “eth” port on the Loihi box, and connect the other end of the cable to the superhost. If a microSD card is present in the microSD card slot, and it has not yet been set up (see below), remove the microSD card from its slot. This is done by using a pair of tweezers to push the card in, and then releasing it (the card slot is spring loaded). Next, use the tweezers to grab on to and gently remove the card. If necessary, set up the microSD card as described below. Then reinsert the microSD card into the microSD card slot. Be sure to push the card into the slot far enough to engage the spring-loaded latch. Turn on the bench power supplies (in any order) and check that the system boots properly. The user guide is especially useful for reading status LEDs on the host (see section 5-3). The image below shows the location of components important to the Nahuku / GHRD Loihi system. Install the two FPGA RAM modules on the host (see image above for where they should be installed). Connect the Nahuku board to the “Nahuku board connection” indicated above. The pins in the connector can be quite fragile. Ensure that the two sides of the connectors are lined up before applying pressure to mate the two connectors. Connect the USB tty cable (microUSB male to USB-A male cable) to the “TTY” port on the host, and connect the other end of the cable to the superhost. Connect the Ethernet cable to the ethernet port on the host, and connect the other end to the superhost. If a microSD card is present in the microSD card slot, and it has not yet been set up (see below), remove the microSD card from its slot. The card slot has a latch that is spring loaded. To remove the microSD card, push it into the card slot, then release. Once the microSD card is unlatched from the card slot, it can then be removed by sliding it out of the card slot. If necessary, set up the microSD card as described below). Then reinsert the microSD card into the microSD card slot. Be sure to push the card into the slot far enough to engage the spring-loaded latch. Connect the power brick to the power port of the host. Plug the power brick into the wall socket. Turn on the power switch on the host and check that the system boots properly. run a Python script to create the SD card image. Instructions for each step follow. These steps are based on this guide. These steps should be performed on the superhost. You will need root access. For simplicity, begin these steps in a new empty directory on a partition with several GB of free space. Begin by switching to the root user. Create and navigate to a new folder for storing Ubuntu files. Download the latest Ubuntu 16.04 release compiled for ARM. Untar the files from the downloaded tarball. Install qemu-user-static and copy it to ubuntu-rootfs. Copy the superhost’s /etc/resolv.conf file to ubuntu-rootfs. This will allow us to access repositories on the internet in later steps. Return to the parent directory. If you do ls, you should see the ubuntu-rootfs directory that you were working on earlier. The ubuntu-rootfs directory you set up contains operating system files. We will now use chroot to act as though we are using those files rather than the actual superhost OS. Note that we are still running as the root user. Begin by mounting system components and running chroot. Install a minimal set of general packages. Since you are in the chroot environment, these will be installed inside ubuntu-rootfs, not the superhost’s OS files. Install packages needed to run Loihi models. Add a user to the OS, and give it admin privileges. We will call our user abr-user, but you can use a different name if desired. We use loihi-mh for our Wolf Mountain / Meridian Hill system and loihi-ghrd for our Nahuku / GHRD system. If you have more than one of the same type of system, use a more detailed naming scheme. Assign a static IP to the board. Update DNS configuration based on the network connection. This will modify the /etc/resolv.conf we changed previously. When prompted, select “Yes” to the dialog box because we want to allow dynamic updates. Add instructions for setting up NFS. But stay as the root user for the remaining steps. The Loihi specific configuration files can be obtained from Intel’s cloud server. Download all of the files below to the directory that contains the ubuntu-rootfs directory. zImage: A linux kernel compiled for the host. u-boot.scr: The uboot script for configuring the FPGA. socfpga.rbf: The FPGA configuration file. Additionally, you need the u-boot preloader image, uboot_w_dtb-mkpimage.bin. The location of this file is also system dependent. Wolf Mountain: Download NxRuntime_01_05_17.tar.gz from the Intel sharepoint site and extract it. uboot_w_dtb-mkpimage.bin is in the board folder. Nahuku: Located in the /nfs/ncl/ext/boot/ghrd_2018-05-17 folder on the Intel cloud server. And the following files if you are setting up a Nahuku system. The easiest way to make the SD card image is to use a Python script provided by RocketBoards.org. We assume in the following steps that you are in the directory containing ubuntu-rootfs and the Loihi FPGA files, and that you are still acting as the root user (if not, do sudo -s). Download the SD card image script. Run the script with to create the SD card image. Replace <device-dtb>.dtb below with the appropriate *.dtb file from the previous step. After running this command, you should have a sdimage_small.img in the current directory. Partition 1 (500 MB): contains the /boot partition, which contains zImage, socfpga.rbf, <device-dtb>.dtb, and u-boot.scr. Partition 2 (3 GB): contains the Ubuntu OS file system. Partition 3 (10 MB): contains the u-boot preloader image. The partition sizes should not be changed from the values above. When making an SD card for the Nahuku system, the Python script may throw an error when finalizing the third partition. This error can be safely ignored. It occurs because the uboot_w_dtb-mkpimage.bin image for Nahuku is 1 byte larger than the 10 MB partition size. However, this does not seem to impact the functionality of the SD card image. You should be able to determine which device (e.g. sdc) is the SD card via the size and mountpoint. Write the SD card image to the physical SD card. Be sure to use the correct device in the dd command below. Using the wrong device will destroy existing data on that device. where <device> is the device determined with lsblk. Remove the SD card from the superhost and insert it into the host SD card slot.